To follow up on the povery trap post, the problem with our current taxation system is that it's designed, approximately, according to a set of ideas that pretty much mathematically imply the poverty trap (see previous post for the 5 "reasonable" conditions). A better way, but certainly not the ultimate way, to design a taxation curve is via a variational principle: find the curve that optimizes total "goodness". So since I was procrastinating on my statistical mechanics homework I did some of the work to solve this problem within my toy model framework. Again in my favorite computer algebra system. The ultimate model would of course take into account the real distribution of income and some measure of the feedback response (change in distribution of earned income as a function of the tax curve). Here x is your take home income, and dx is the derivative of your take home income with respect to your earned income (the slope of the black curve above). We need to optimize the mean value of this utility enforcing certain constraints. Namely the government needs to still keep 25%, and I also required the take home at 0 earned income to be .25 median income and the slope at earned income = 8 median incomes to be 0.75 (so you could easily charge marginal rate of 0.75 above that point. 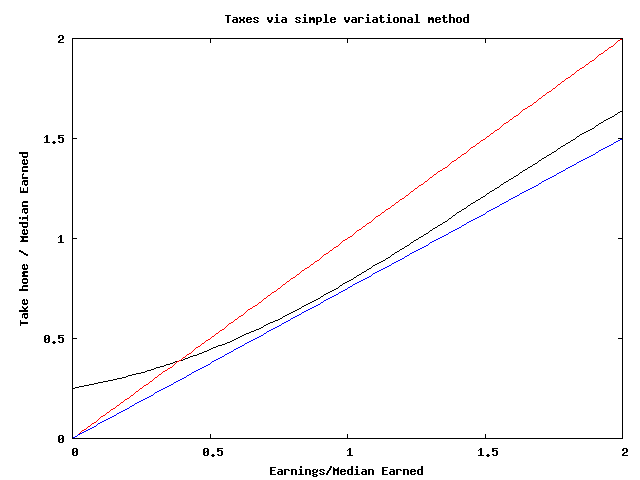 In my simple lognormal model there are very few people above 8 median incomes (about $352k/yr currently). The rational is this: we want to strongly discourage low or negative slopes that cause traps at certain incomes, so we exponentially penalize them with and we also add some measure of the benefit that you get from consumption of a certain number of dollars. This should have a marginally decreasing slope, since acquiring more of anything is less and less desirable the more of that thing we have. That's the portion. It's a toy, but it has the right general shape. Still, look at that curve, just like what you'd want right? 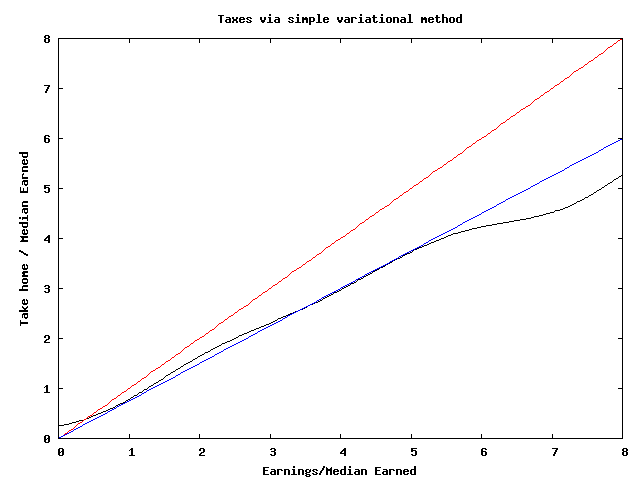 It satisfies TANSTAAFL to reasonable approximation (the error in the average income constraint is 0.07 median incomes, getting better would require more careful numerical programming). Here's the lower end, where the poverty trap was before. These are just toy models, the real earned income distribution is not lognormal exactly, and the earned income distribution is a dynamic function of the taxation rate and the overall economy, so there's a feedback effect. But the point is that thinking about the redistribution portion of tax policy as just finding a simple function would fix what's wrong with our tax system in terms of trapping people in the poverty zone (below 1). Receive P dollars (pay if negative). The big problem with this system is that it doesn't appeal to politicians who want to fiddle with everything in sight.